Captured in a rest area near my city. 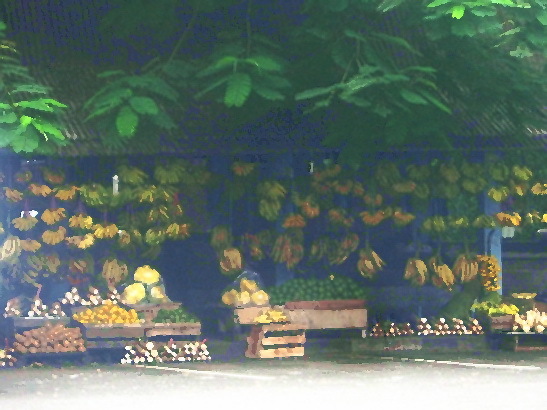 While my husband took some money on an ATM machine nearby, I noticed some fruit seller stalls there. I saw bananas, avocados, taros and jackfruits were on display. We bought nothing as we're in a hurry to reach my BIL's house that day. This pic was rather blurry, I tried to make it looked better with an oil paint effect. We also have those fruit stands here. :) Have a fabulous week. Very interesting ... excellent composition. Oil exquisite effect. Nice effect. I like the colours. I wish your photo showed on my screen. But from what you said that you added some oil paint effect I would guess it looked lovely.